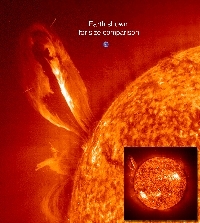 Large, eruptive prominence in He II at 304Å, with an image of the Earth added for size comparison. This prominence from 24 July 1999 is particularly large and looping, extending over 35 Earths out from the Sun. Erupting prominences (when Earthward directed) can affect communications, navigation systems, even power grids, while also producing auroras visible in the night skies.